I'm done!!! I really loved doing this project but I'm happy I'm done. I'm really looking forward to printing this....now if I can only figure out how I want to print it. Anybody have any suggestions? So let me review with you the last few days leading up to Christmas in case you missed it on facebook. Oh, & be sure to check out Week 1, Week 2 & Week 3 if you missed those. Can you tell she could hardly wait for Christmas? I should have recorded her singing this. It was adorable! This is our Emmie. She didn't even hesitate when she said this. We sponsor two girls through World Vision. Each year the girls browse the World Vision Catalog to figure out what they want to "buy". Then they make up a chart & raise the money by doing odd jobs around the house during the month of December. 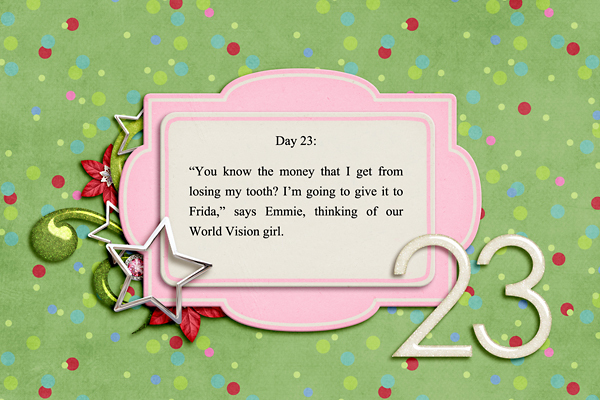 Emmie wanted to give her "tooth fairy" money away. Truly! You should have seen the light in her eyes when she said this. It's like it clicked. She knew that He is the reason! If you all did a December Daily Album I would love to see it. Just hook me up to your gallery or blog. I'll take a look later this week. I won't have any releases this week. I've been taking a much-needed break from designing. I'll be back next week with some new stuff for you all! 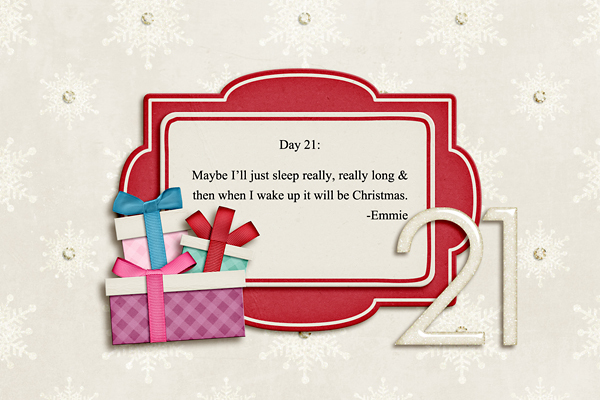 Do you want to see more of my December Daily "In Quotes" pages? Well, that's what I'm going to show you today. And here some links to remind you of my little project. 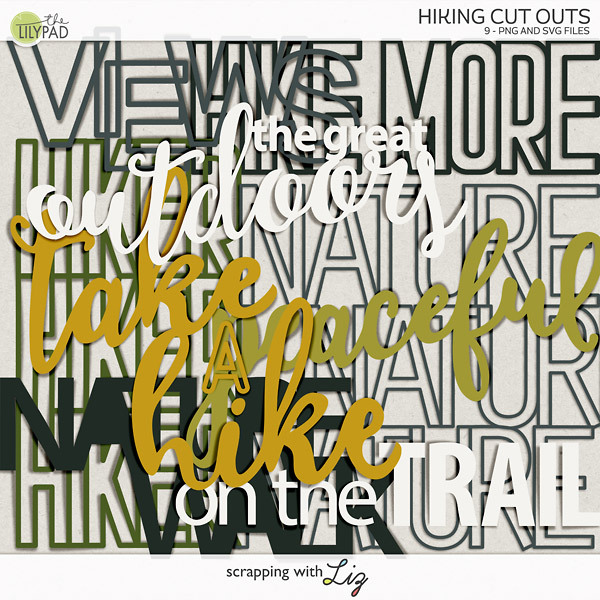 Week 1, Week 2 and here's a Freebie & Tutorial to help you get started, well okay, maybe not to get started, since it's well into December BUT grab the freebie, learn how to resize your templates & you can use the templates for almost anything. Ah, the oblivious child. I think every family has one....or should have one. It's quite cute. I think I have to agree. Hot chocolate is too hot! It's like she's making us feel guilty for telling her the truth about Santa. My daughter did indeed eat Frosty's head & she told me it was delicious. Maybe I shouldn't have put the Christmas tree up until the day before Christmas.....but what's the fun in that? I can't believe I only have 5 days left! I'll be back next week, after Christmas (shwew! ), to show you my last few pages. And remember, even if you don't do a daily page or daily photo or daily whatever.....at least jot down some of your memories. You can scrap 'em later, after the holidays, when things aren't so crazy, right? Resizing a Card Template Video Tutorial with FREE Templates! As promised here's a little video tutorial to show you how to resize a template. This is just a basic tutorial (I'm using Photoshop CS3) that will show you how to turn a 4x6 into a 5x7, 4x8 or even an 8x8. Ultimately you could take any size template and adjust it to make any size that you wanted A rectangularly shaped template may need more adjusting if you try to change it into a square design. It all depends on the design of the template. 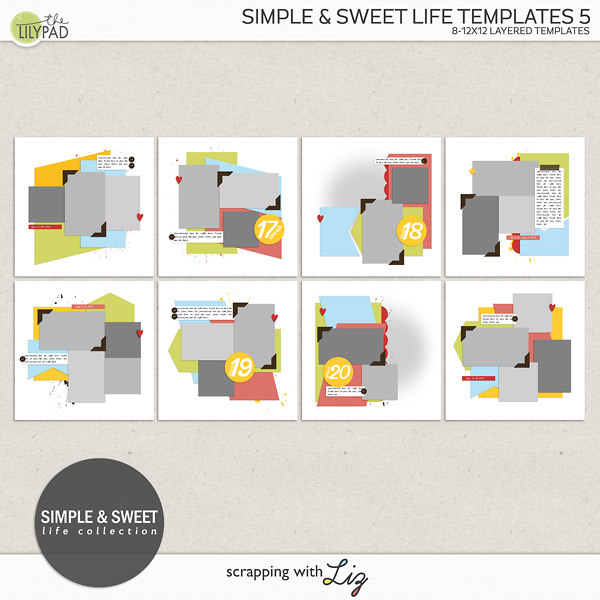 Here are the FREE 4x6 card templates. I created them based off of the December Daily "In Quotes" pages that I've been making. Feel free to just use these as photo templates too. All you have to do is remove the journaling part & place a photo there instead. Just click on the pic to download. I'm back to show you my December Daily pages from this past week. If you missed my post last week about what I'm doing you can read about it here. I left off on day 6. So here we are starting on day 7. Day 7's quote had me in tears. Kyla cannot wait until we go get her little baby sister. She's ready to have a playmate & someone that will be her best friend. For those of you who might not know we are going through the adoption process. Read more about that here. This was just the most precious site I ever saw. I really should have taken a picture. Oh, the joys of having a 4-year-old redecorate the Christmas tree! Check out Andrew Peterson's Behold the Lamb of God Album. It's not your traditional Christmas music but it tells "the true tall tale of the coming of Christ". My hubby & I got to do a little Christmas shopping by ourselves followed by a nice little dinner. Emmie likes to make me laugh! That's it for now but make sure you stop by the blog tomorrow for some FREE template based off of my December Daily pages. Plus there will be a video tutorial to go along with the card templates. 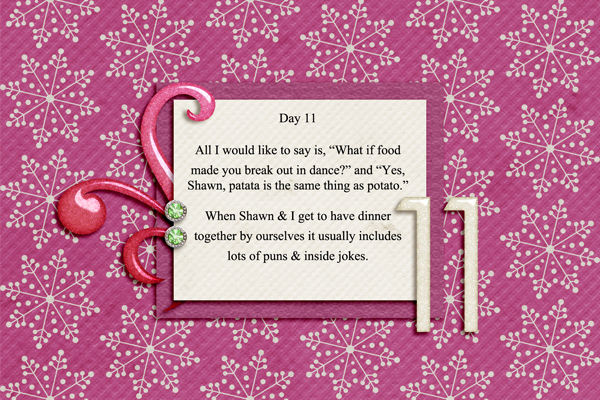 Here's my little twist on December Daily. 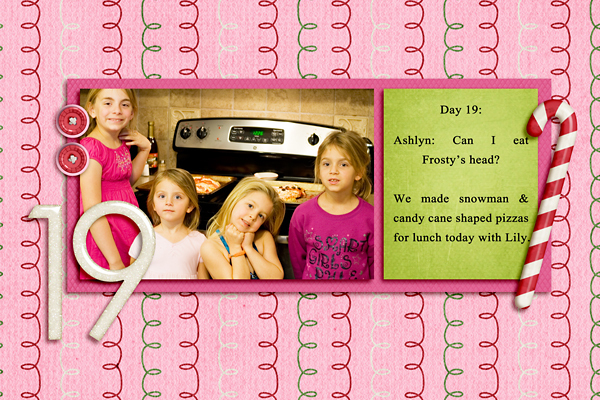 If you don't know what December Daily is you can check out Ali Edward's projects. It's basically documenting 1 story for every day leading up to Christmas. You can do it through pics, scrapbook pages, journaling, etc... Whatever works for you. Anyway, since I knew taking daily pics was just not going to work for me, (believe it or not I'm horrible at remembering to take pics every day) I decided to do my pages with quotes. I'm trying to write down a quote from one of my girls every day & then scrapbook it on a 4x6 card. I think I'm going to end up with a really nice little album that I'm going to love reading every Christmas. I'm still trying to decide how I might print it out. I'll let you know what I decide to do. So here are my pages so far. 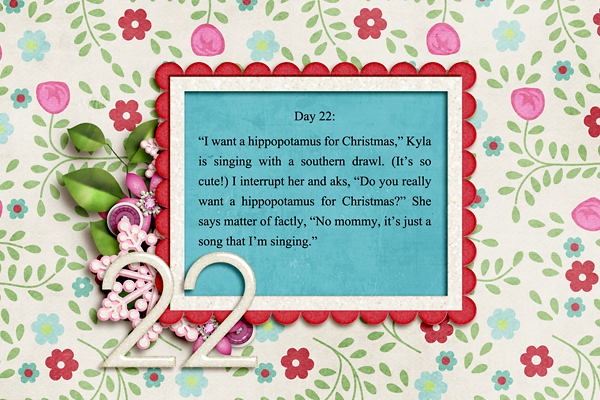 I've chose Magical Christmas by Jady Day Studio & Flergs to scrap all of my quotes. For those of you who might be wondering what Window Wonderlands is, it's an event where our little town decorates the downtown area & people sit in the windows of the little shops and are dressed up in old-timey costumes. The little businesses have hot cider, hot chocolate and cookies. There's music & even carriage rides. We've gone every year since we've lived here. I love the tradition. 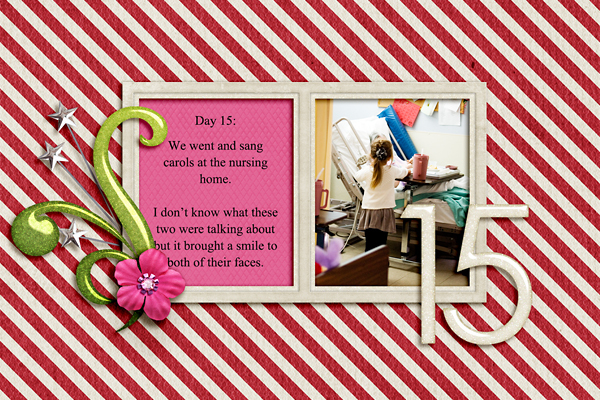 On Day 5 I didn't get a quote but as I was pre-making my page hoping to hear something from my little girls I heard my hubby reading to them. It was perfect. I should mention that Lucy is our cat, for those of you who might be wondering who Lucy is. So that's what I have so far. I'll be sharing my pages weekly on my blog but if you want to see daily updates make sure you check out my facebook. I've been trying to post them there at the end of each day. And Anita wanted to know if I was going to be making these into templates & selling them. Since I don't have time to put together a whole album right now I think what I'll do is turn a few of them into templates & then just give them away here on my blog & facebook for free! Sound good? I'll keep you posted. 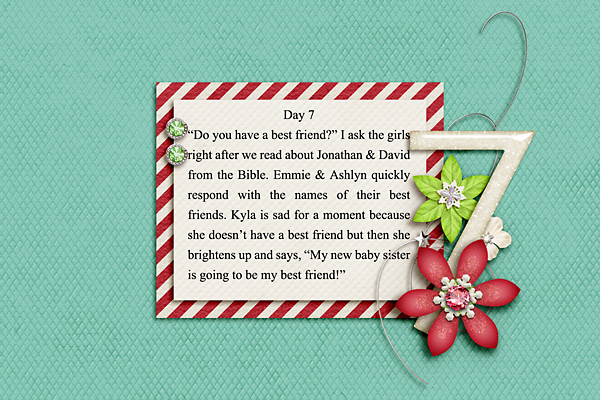 Also, my friend Kami has a little December Daily freebie on her blog. It will help you with your daily pages or photos. 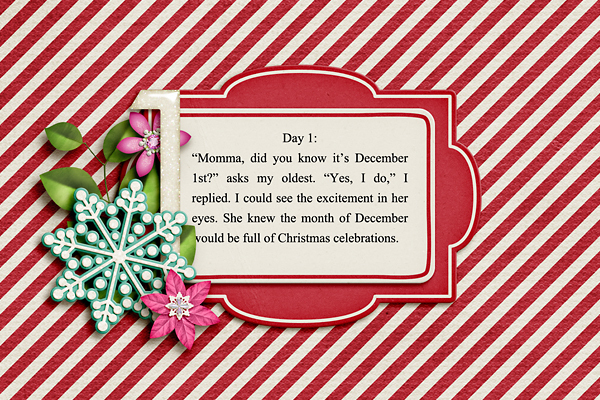 Plus you might want to check out her December Daily photos for inspiration.